When you visit Mammoth in the warmer months be sure to hike a few of the many groomed trails that wind throughout the Inyo National Forest along majestic mountain tops with magnificent views that go on for miles. On your hikes you will discover the many hidden crystal-blue lakes, rushing streams and peaceful surroundings that can only be reached by foot or horseback. 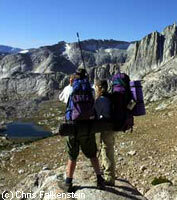 In the Sierras, there are day hikes, and overnight hikes, some strenuous and some a casual stroll. There are thirty-one trailheads providing access to the 1,308,477 acres of wilderness backcountry for hikers seeking to escape into primitive and pristine areas. These hikes require special permits, and have trail quotas for overnighters. There are several pack stations listed in our tour guide section that can take you where no man has ever gone before. If you are thinking about going in to the wilderness and planning an overnight adventure, you will need an Overnight Hiking Permit as they have quotas on how many visitors can have an overnight stay. Reservations are required, they book up early and you must plan six months in advance to guarantee a spot. Yosemite is also a great place to venture off to with more unbelievable scenery. Mammoth is an never ending set of trails, The trail system is constantly improving from folks like the Mammoth Lakes Trails and Public Access folsk who are planning, stewarding, interpreting, promoting, and sustaining four season trails. Mammoth Lakes provides more than 70 groomed trails throughout the area, from simple to challenging. Many MAPS are available in our Travel Section or available at the Visitors center in town, or ask any local forest ranger for recommendations or directions. Mt Whitney offers some gorgeous views, but this is not an ordinary hike. It is 22 miles round trip with a climb of 6,000 feet. You may find ice along the way in May, June and September, so you must bring appropriate gear. For more information, see the info on Mt. Whitney. Special Deal Everyone wants a discount, right? We know the way to cut the cost on Mammoth lift tickets. Who has Mammoth Mountain discount lift tickets?